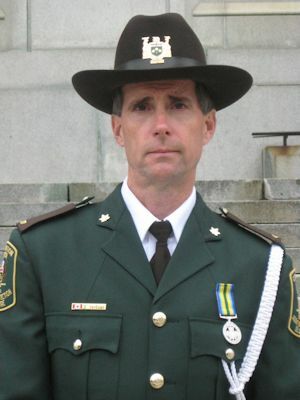 The Ontario Ministry of Natural Resources and the Ontario Conservation Officers Association are pleased to announce that Dan VanExan has been selected as the 2013 Conservation Officer of the Year. Dan began his career with the Ministry of Natural Resources (MNR) nearly 35 years ago. After having a number of contract positions throughout the province, Dan was appointed as a Conservation Officer (CO) in September 1983. Dan has been a coach officer, a trainer, a mentor and a role model. Like many of our officers Dan is an accomplished investigator, who has demonstrated his commitment to the job and to protecting the public through successful investigations. 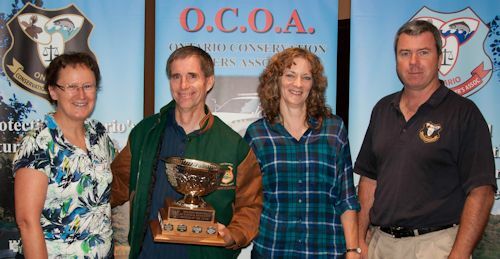 Dan VanExan was nominated for the 2013 Officer of the Year Award by his peers, and was selected to receive the award by a provincial committee comprised of natural resources law enforcement staff, including representatives of the Ontario Conservation Officers Association (OCOA). The official award ceremony took place at the annual OCOA Conference held at the Marriott Courtyard in Vaughan, August 15 to 17, 2013. Dan was presented with the Ministry of Natural Resources (MNR) Officer of the Year award by Lois Deacon, Director MNR Enforcement Branch and Assistant Deputy Minister, Provincial Services Division Tracey Mill. The OCOA award was presented by President Joe McCambridge. 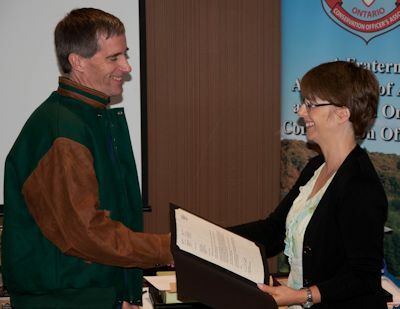 In addition, Dan also received the Shikar-Safari Club International Wildlife Officer of the Year Award and the Midwest Association of Fish and Wildlife Agencies (part of the International Association of Fish and Wildlife Agencies) Officer of the Year Award. In 2009 Officer VanExan was awarded the Peace Officer Exemplary Service Medal (POESM) for 20 years of service as a Conservation Officer at the POESM ceremony and will receive his 30 year bar in 2014. We would also like to officially acknowledge and congratulate Matt Brooks, Bruce Tomlinson and Mitch Phinney on being nominated for the 2013 OOY award as well as their continued dedication and professionalism to natural resource law enforcement. The Officer of the Year Award acknowledges officers like Dan, who demonstrate the highest level of dedication and professionalism amongst the ranks and pays tribute to the high quality of Conservation Officers in the MNR Enforcement Branch. Please join us in congratulating Dan VanExan as our 2013 Conservation Officer of the Year!